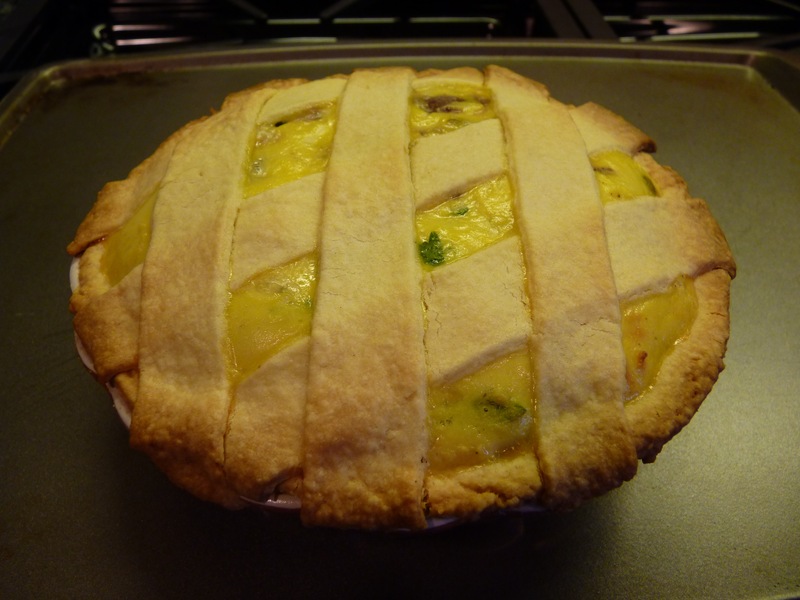 Pizza Rustica, more quiche-ish than pizza-ish, was on the schedule for this week’s Tuesdays with Dorie recipe. Dinner at our house is always tasty, but rarely this cute! As I often do, I cut the recipe in half, which fit perfectly in my 6″ pie pan. A much better size for two people. I omitted the prosciutto and added a mix of green and Kalamata olives. I noticed really late in the game that it’s supposed to cool completely before serving, which would have made for a very late dinner. I opted to cool it for 20 minutes, at which point it was nicely warm but not hot. Ready to give this a whirl? You can find the recipe on page 430 of Baking with Julia. Thank you to this week’s hosts: Emily of Capital Region Dining and Raelynn of The Place They Call Home. They will have the recipe posted on their blogs today. This looks really yummy! It really does look rather like quiche than like pizza. I often make vegetarian quiches myself and find this quite inspiring! Next time i will try something similar. Pizza or not, it looks delicious. I’ll definitely check out this recipe. And thanks for the hint about the sugar! I like the olive subs! I’m glad you enjoyed it. The olive substitution is a great idea. I love the look of your big lattice pieces. Definitely not pizza–but good pie rustica. 😉 I need to get a 6″ pie pan, my husband wouldn’t even try this, so there is still some left over, but I think I’ve had enough of it. I wish the recipe would have said to chill the dough, but it didn’t so I made it at a time when I needed it to be done sooner than later. Your pie looks absolutely gorgeous! Nicely done! You are right, your pizza is so cute! I think olives would have been great in this. I just made it as is. Your pizza rustica looks perfect! I haven’t even made mine yet. Cute little pizza rustica! It was my first lattice crust, too. But I actually really liked te sweet crust. Glad I made this one.